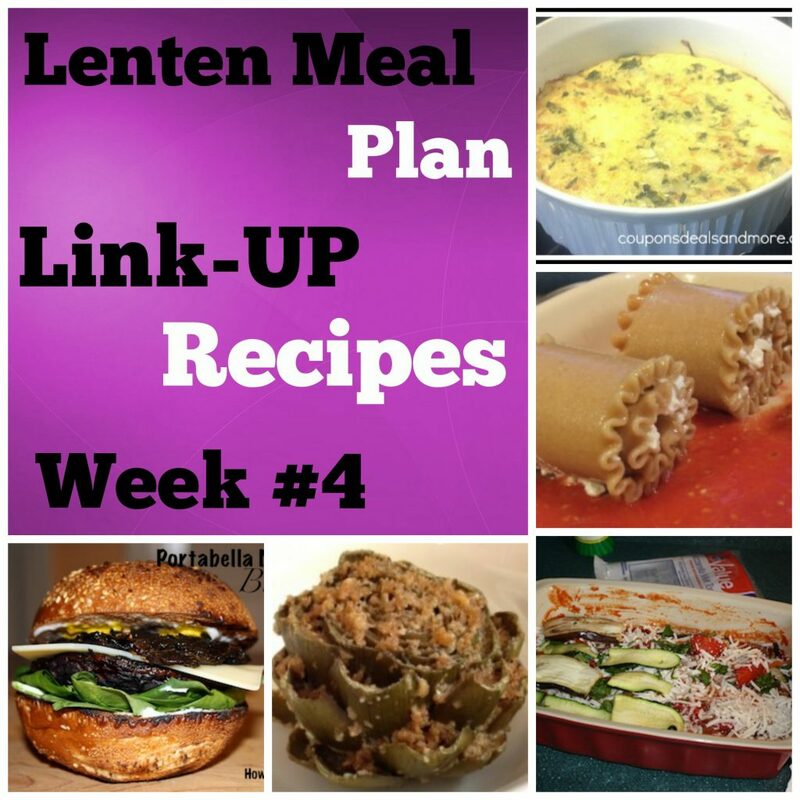 Welcome to Week 4 of the 2014 Lenten Meal Plan Link-Up!! Make sure to visit my co-hosts Sarah O. from TwoOsPlus More and Abbey from Surviving Our Blessings for more Lent Recipes and be sure to check out all the recipes that have been linked below! Make sure to grab our button if you are joining us! 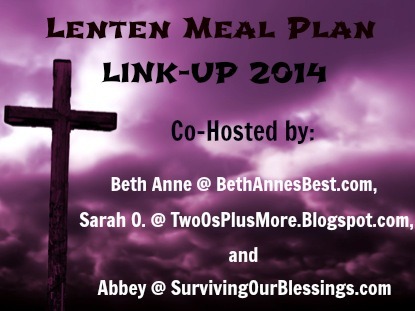 Welcome to the third week of the Lenten Meal Plan Link-Up!! Each week I will be sharing some recipes that I have received from other bloggers to share along with some recipes that I have tried and eaten throughout the week. Feel free to Link-Up any OLD or NEW meatless meals you have posted about. The hosts have the right to delete any links that are not appropriate for the link-up. Feel free to embed Pinterest Recipes or link to recipes you have found online. Feel free to just blog about what you ate or what you are planning on eating. Have fun and have a BLESSED LENT! If you have any questions feels free to email me at bethannesbest at gmail dot com or leave a comment! 1. Artichoke and Cheese Frittata Recipe from Ann’s Entitled Life– This looks like it is similar to a quiche without the crust (maybe that is what ‘frittata’ means?). Which is right up my alley because I’m not a big fan of the crust sometimes. This is also a good way to cook some leftovers (as long as they are meatless or it’s not Friday) and vegetables that are at risk of going bad. I actually made something similar to this last year during Lent. In my version you used a muffin tin to make individual portions instead of one big pot…either one would work depending on how many people will be eating. 2. Stuffed Lasagna Rolls from Little House Living – I love Lasagna and this is a fun way to make it differently. It’s almost like a mix of stuffed shells and manicotti but with lasagna noodles. I’ve had versions of this as appetizers at restaurants and it’s really good. 3. Veggie Loaded Lasagna from How To Have It All – This looks like another really good lasagna recipe. Instead of using noodles she uses several different kinds of veggies with all the sauce and cheese. It looks really good and something different to try. 4. Stuffed Artichokes from Drug Store Divas – My grandma used to make these ALL THE TIME…..back in the day when they “looked gross.” I’m not sure I’ve ever had one since reaching adulthood so maybe I’ll try it out now. 5. Marinated Portabella Mushroom Burger from How To Have It All – I love burgers and I love mushrooms so this looks like a good substitute…this actually looks DELICIOUS!!!!!!!!!!!!! I don’t even need to say anymore because you all need to go eat this right now!! Also we have created a collaborative Pinterest Board for the link-up. If you would like to be added to the link-up be sure to added as a collaborator make sure you are following me on Pinterest and email me or leave a comment with your Pinterest name and I’ll add you. The more recipes we can get the better the board will be! Pinterest Blog Tip: Collaborative boards are a great way to get a lot of repins and exposure on Pinterest. Make sure to check out Week 1 and Week 2 and Week 3 of the Link-Up! Great Post it is hard to decide what to make for Lent. I found you through the Catholic Bloggers page over on Facebook. I look forward to seeing more of your posts. Thanks for the great round up and linky of recipes. I look forward to following you during the upcoming weeks.